Eating out in Rosario is a pleasure! There is a large selection of restaurants ranging from traditional “Parilla” (barbecued meats) restaurants to trendy music joints and romantics restaurants. 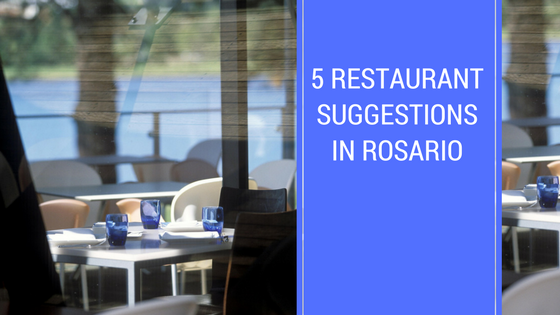 Here are 5 suggestions of places to eat in Rosario, Argentina. 1 –Lova is a nice restaurant and good choice for dinner. 3 – Los Jardines: A lively restaurant right by the river with a great menu and friendly atmosphere. 4 – La Estancia – One of the oldest parillas of Rosario, excellent meat and great atmosphere. Good option for large groups. 5 – One of my favorite places in Rosario would be “Refineria” located in Pichincha – neighborhood close to the center of Rosario. Parrilla meet fine dining. If you are planning to eat out on a Saturday night (after 9.30pm), make sure to book a table as most restaurants will be full and you may have to wait for a table. Hope you have a nice stay in Rosario! Connecting Rosario to the World! Want to know more about Rosario? On this website you will find detailed information about Rosario and various guides to discover the city of Rosario in Argentina.